See The High Scores on Tuesday, July 14th at 8:30. We'll be at 'The City' Theater at Broadway Comedy Club. 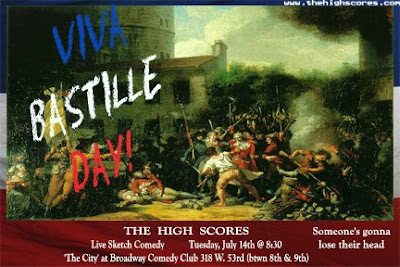 Yes, we are playing on Bastille Day. We celebrate EVERYTHING. 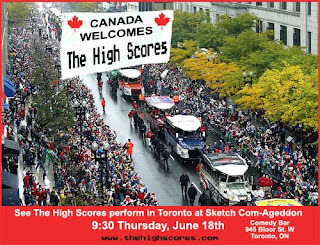 The High Scores are off to Canada to perform at Sketch Com-Ageddon! If you are in the Toronto area see us on Thursday the 18th at 9:30 at Comedy Bar on 945 Bloor St. W.
So you're sitting around, just waiting for news on The High Scores. Maybe you keep hitting refresh on your browser, trying to get your High Scores fix. Your biggest prayer has just been answered. Become our fan on Facebook! 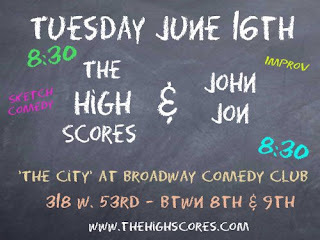 See The High Scores with special Improv guest "John Jon" next Tuesday, June 16th @ 8:30 at 'The City' at Broadway Comedy Club. 318 W. 53rd (btwn 8th and 9th). It's only $5 and a drink, and just for reading this, use the code "snuggie" at the door to get a free admission for a friend. Or an interesting stranger. P.S. The rumors are true - The High Scores will be playing a sketch festival in Toronto later this month. More later.